I love this look from Bergdorf’s. Glitter Tattoos in a Fifth Avenue window. Rapunzel and two lumberjacks in a Bergdorf window. 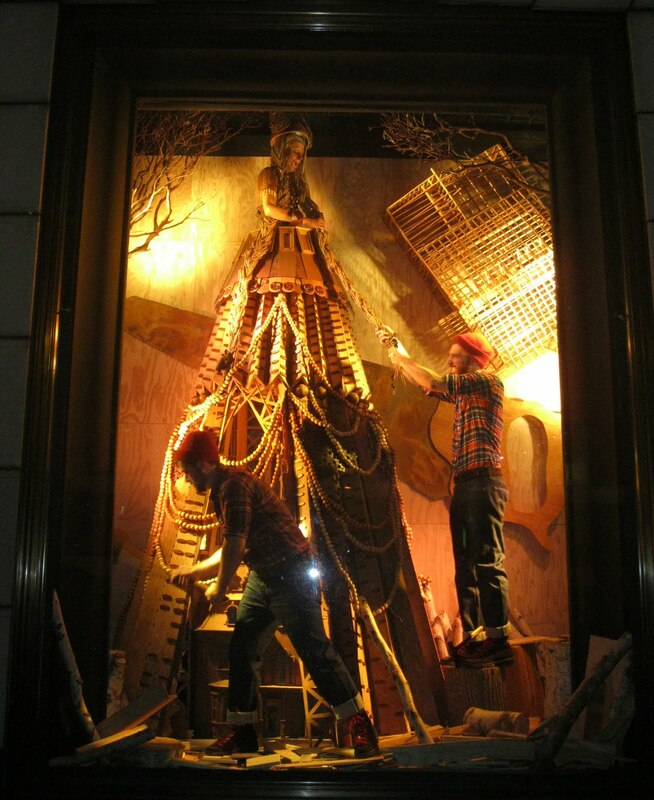 A live marionette in a Bergdorf window. The man, the myth, the legend. 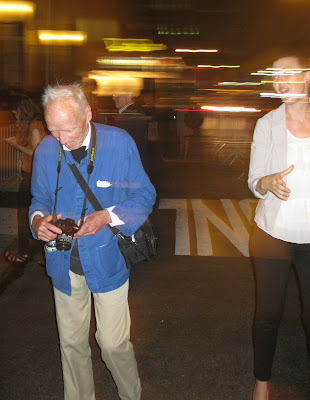 New York Times photographer Bill Cunningham, in his trademark blue smock, at work on Fashion’s Night Out. 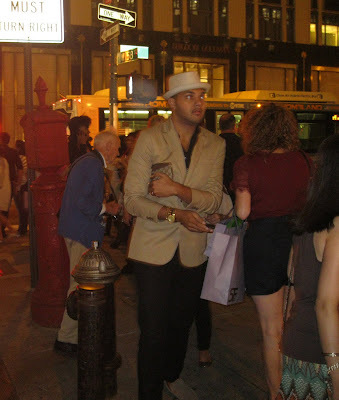 Bill was working away on 58th Street and 5th Avenue, just outside of Bergdorf’s, at 10:30PM. This being Fashion’s Night Out, some people started to recognize who was moving amongst them and three girls even took a picture with him. But there eventually got to be so much attention on him that he held up a finger and said, “One minute,” to further photo requests and then mildly worked his way down the street, still snapping away. A moment later he was gone, as quick as an elf. I’m not kidding, you could not find him at all, it was as though he had vanished. I don’t know how he did it! This is the last picture of him I took before he got away. Bill is my absolute hero. How lucky of you to see him in the flesh running away from fame. He is the best. Have a grand weekend, my deares Jill. 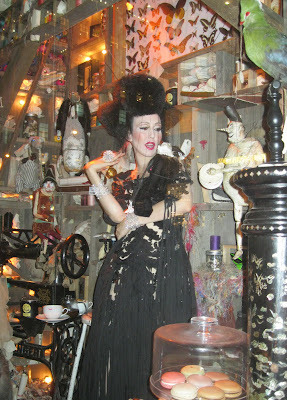 What a fabulous time--I adore seeing all of these windows, so a special thanks for that work. These photos of Cunningham are so cool. One of these years, I'll get to FNO! I heart Bill C so much. Your pictures are fantastic, you capture the frantic beauty. Wish I were there! Jill, this looks so fun! I had such a great time at FNO in San Antonio and took so many pictures that I am going to cover it in three posts...Hope I don't bore anyone, but it was very visually stimulating..lots to look at! Thank you, my dear Jill. It is nothing new, but I had to put it all together for newcomers. One day we will meet, I am sure. Hi Sacramento, it was so great to see Bill at work again. He really does not like people recognizing him and trying to take pictures with him. He's gracious, but you can see the determination to get away so he can get back to taking photos. And I really do love those posts you put up about blogging tips and reciprocity. You have as much to teach us about graciousness as Bill Cunningham. I can't wait to meet you in person, I'm convinced it will happen. I hope Bella is with us too! Catherine, I really hope on one of these Fashion's Nights Out you are with me so we can go up and down Fifth Avenue taking pictures. For me, it would be like a master class in photography, a class I need to take! Hi Terri, I would be so interested to read and see your take on FNO, in any city. Also, I'm excited about the posts you've done about your daughter's wedding. I can't wait to see your final outfit choices! Hi Patti, thanks for stopping by, thanks for following! Did you see Bill Cunningham New York yet? It's such a great movie and now I am mildly obsessed with seeing Bill as much as I can. You can definitely find him at 58th and 5th Avenue on FNO, it's a given, but any other times are trickier, and I will confess I have tried with no luck! Hi Paula, I so love Nicholas Kirkwood heels and one of these days I need to try on a pair, just for fun. I am not a shoe gal, give me a wedge or a flat any day of the week, but I LOVE seeing crazy shoes on other people! Hi Pam, I have been loving your coverage of FNO in San Antonio and have been deeply dying over your friend Eleanor trying on all that Prada! She looked amazing in both dresses.